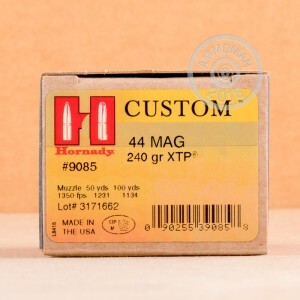 If you'll settle for nothing less than a .44 Magnum on your nightstand or as your hunting sidearm, you should also settle for nothing less than Hornady Custom ammunition featuring the time-tested XTP bullet. These powerful self-defense rounds fire a 240 grain hollow point at 1,350 feet per second, harnessing the high power of the .44 Mag to deliver the deep penetration that is the hallmark of the XTP. 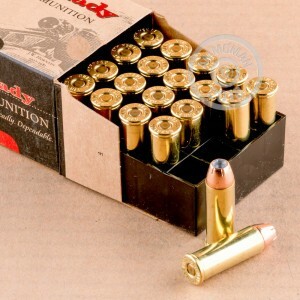 This ammo is loaded in Grand Island, Nebraska using non-corrosive Boxer primers and brass cases. 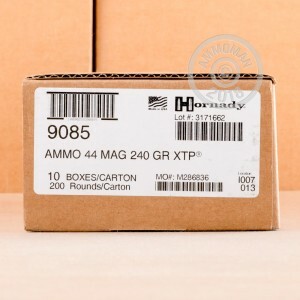 Pick up a few of these 20 round boxes or any other items priced $99 or more to get free shipping from AmmoMan.com!